New release ‘Men, Women & Children’ puts iMessages front and centre – has film finally gotten over its digital phobia? I went to the movies to sit in the dark with my phone turned off – as those karaoke frogs politely requested in horribly twee pre-film adverts beloved by theatre management – not to stare at a screen on a screen. But with the rise of silent communication mainlined through the throbbing glow of a pixelated display – and basically the fact that it's just normal now – texting, tweeting and general internet kit has slowly crept into contemporary classics. This has been played out in The Social Network, Easy A, LOL and that memorable flub wherein Kelly Rowland tries texting Nelly on an excel spreadsheet. Yesterday, a trailer for Jason Reitman's Men, Women & Children was unleashed upon the world, featuring a morose-looking Jennifer Garner and a teary Ansel Elgort amongst pop-up texts and messages. Text on screen is as old as the talkies, but how it is displayed visually in film has been a more twisted and taxing journey than the path on a Life game board. There isn't much choice, after all. Read it on screen or listen to it being read aloud. Neither is ideal. Garnished with a tagline that reads: "Discover how little you know about the people you know", the film appears to deal predominantly in text-speak and explores the hidden agendas of furtive sexting. The real plot is about sexual frustration. Txt it! Social media has had a bit of a slow uptake as a narrative fulcrum in cinema – until now. It's been crude and clunky, which makes sense that some of its first advances were in soap operas. Nobody has really done it just right (case in point: Excelly Rowland), but does that mean it should be done away with altogether? "For me, it’s like, ‘How do you tell a story about young people without including this whole other cyber reality?’" says Coppola. "But visually, I don’t know how to work in that element. I’m curious to see how it’s going to be incorporated more in movies because it’s such a part of everyday life. For this, though, I wanted timelessness. And it’s not part of the culture of the book (Palo Alto)." Others are embracing it with nary a thought as to whether in five years' time it will appear as hilariously outdated as Hackers (1995). Namely, director Jon Favreau in Chef, whose story hinges on the scathing @-replies of a restaurant critic. Every tweet is announced on-screen with a cringe-inducing "wee-hoo!" sound effect and pop-up text bubble. It's fairly easy to follow the story this way, as it's right there on the screen for those who are literate and patient enough to read it (Bueller… Bueller?). The BBC's Sherlock has taken the same approach minus the bubble, simply throwing up the textual messages as a distraction in and around the action. More recent, David Cronenberg's Maps to the Stars is a lesson in how to have a conversation while both eyes peruse a screen. We're finally beginning to acknowledge reality: there's now always a third person in the room. This begs the broader question of how technology is generally portrayed in cinema. After all, it's a mostly smaller population of die-hards that question the accuracy of retina-scanning superfuture gadgets that don't yet exist (I'm looking at you, Vanilla Sky). However, everyone has a Twitter handle these days. At the very least, a phone number. We know how this technology works, so we know when it looks bad in film. The Fault in Our Stars – also starring Ansel Elgort – took the chalked-out Pinterest approach to SMS to the glee of absolutely no one; but it served its purpose. Okay? Okay. So then how do you make it look cool? Answer: you don't. 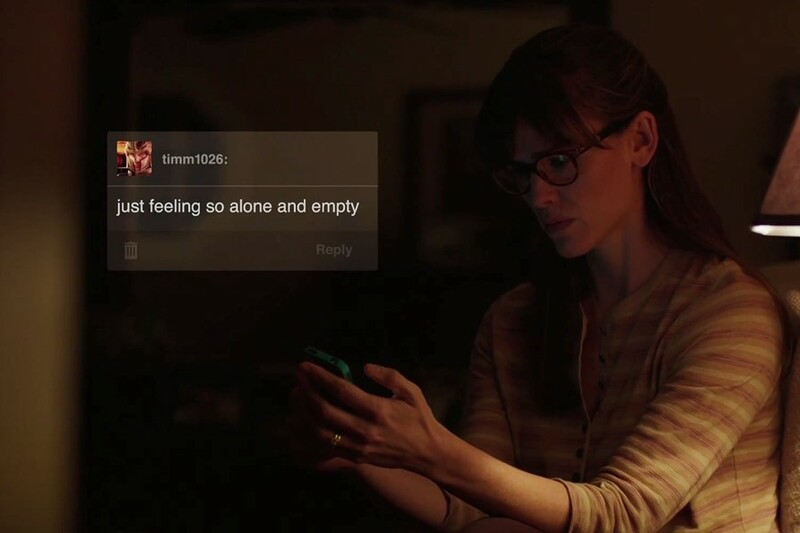 Filmmaker Tony Zhou has created this short film, which takes a closer look at how texting and the internet are portrayed (below). Poorly, for the most part. One interesting takeaway is the TIFF short film Noah, which takes place entirely on screen. You get a sense of the character through the way he uses social media. They're inseparable. One cannot live while the other survives, etc. Okay, so what about other forms of communication pre-SMS? Here's a look at Broken Flowers, where Bill Murray reacts to a letter. It's a central property in the film, and we don't get to see what it says until he reads it out loud to his neighbour. The letter-reveal been a key device in film since 1948's Letters from an Unknown Woman. Letters may be more romantic – kind of like the witty Brady Bunch-era split screens around the invention of the three-way call – but it's a bit difficult to see how they can be incorporated in all these teen dystopian flicks of late without seeming kitcshy or out of place. And with all of these new teen films with 'teen problems', it ain't going away soon. Texts on screen have yet to find gravitas as smoothly-integrated 'non-disturbances'. Maybe Men, Women & Children will be a sea change for text to finally thrive alongside the characters who use it. Perhaps pop-ups can propel a story forward – especially if they are as important to the narrative as IRL communiqué. Yet for the moment, all we get are these annoying workarounds that leave us feeling like picking up our own phones mid-scene. So maybe we aren't all that bothered. But when it's avoidable, why include it? Let's get a show of hands: who likes a subtitle?